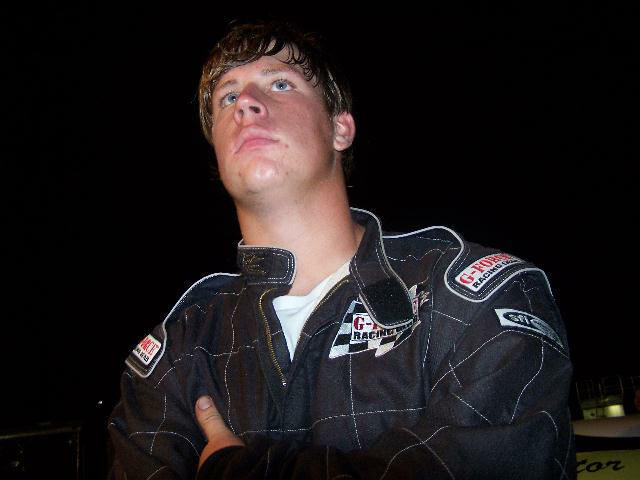 Thomas Praytor, Snowball Derby Pensacola, FL-12-7-08: The Mobile International Speedway US Army Rookie of the Year rolled into Pensacola’s Five Flags Speedway to line up against some of the best late model drivers in the country. 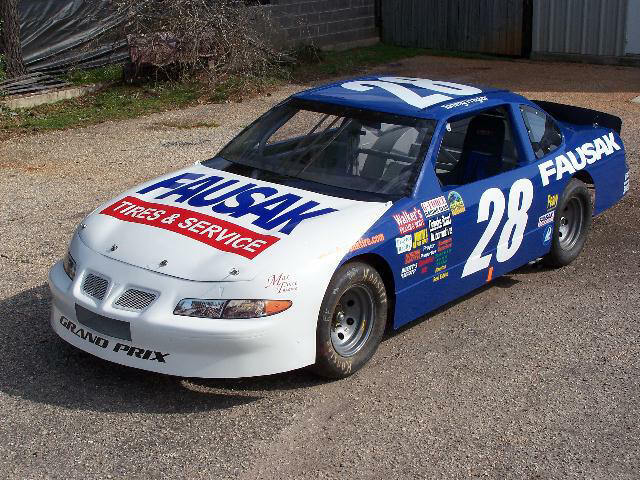 Most teams had NASCAR ties with cars piloted by NASCAR developmental drivers or teams backed or owned by big name chassis and motor builders. The competition is so stiff that most of the local drivers that competed in the Lee Fields Memorial race just a month ago at Mobile International Speedway stayed at home, the Moose couldn’t wait to get to 5 Flags. After two days of practice, the odds for the Salvation Army Pontiac to make the Allen Turner Snowflake 100 looked slim. With 130 late models on the speed charts the Moose was no better than 70th after any session. Our Salvation Army team spirits remained high because we knew that our team had limited tires to work off of during practice while other teams were bolting on new tires for almost every practice session. Fresh tires equal fast times and the Moose didn’t have those resources. What he did have was his hard working crew member Kyle McKay-Cox and a couple of Snowball Derby pickups Adam and Rick Crawford. Bolstered by our own NASCAR connection the Moose was up on the wheel for qualifying, turning a 17.58 second qualifying lap. Four tenths of a second better than his fastest practice time and just a tenth of a second out of the show (For the record it was 7 tenths of a second faster than a certain fat guy qualified the same car in 2007). To say the level of competition has stepped up would be an understatement. Last year the Moose’s time would have started him 19th, this year he was 39th and would have to race his way in through the last chance race. The Moose started 5th, in front of Larry Foyt, son of A.J. Foyt, and soon moved up to 4th but instead of looking for 3rd he was busy holding off Foyt. The Moose and Foyt put on a show until there were 4 laps to go and Foyt was able to take the spot and end the Moose’s chances on getting in the race. Thomas Praytor Pensacola 11-22-08: Our Max Force team rolled into Pensacola’s Five Flags Speedway with a lot of questions marks from it’s last test session. The last lap of the last test ended with the Moose slamming into the outside retaining wall in turn 3. 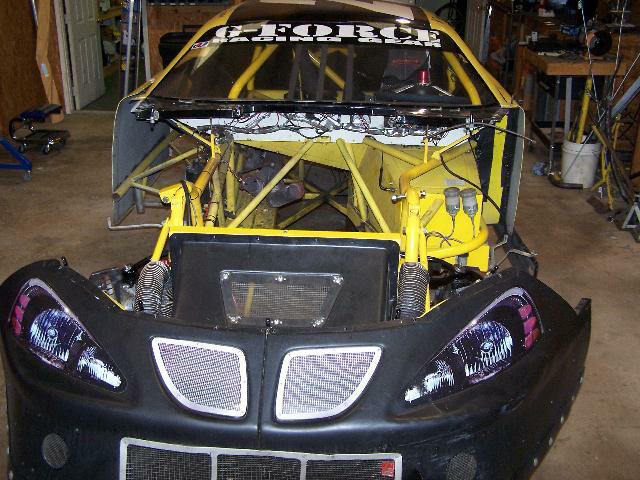 With everything we’ve had going on over the last 2 weeks our team struggled to piece the G-Force Pontiac back together. A lot of friends pitched in to make it happen; Mike Walker and his guys stopped their regular work to do body work and paint our body parts, Dan Vanderley making a late night trip to the shop on Friday night to replace a high pressure power steering line that would have kept us from going to the track and Kyle McKay-Cox pretty much lived at the race shop. Finally at the track the first order of business to was to get through a pre-derby tech inspection. Ricky Brook’s tech line is one of the toughest in all of racing, last year he threw out Kyle Busch over an 1/8th of an inch. As racers we pushed the envelope on some areas and of course he caught every one of them and we’ll be fixing those before we return for real in 2 weeks. Once through the room of doom it was time to shake down the repairs we made since the last test. On track the Moose put the G-Force Pontiac through its paces. Comfortable we were headed in the right direction, we bolted on a new set of tires and the Moose clipped off a lap within 2 tenths of second of the pole sitter form the last race. A few more changes and a after some long runs the team wound up a 12-hour test day and headed for home. Picture: The Moose making one of our many gear changes. Thomas Praytor Mobile 11-22-08: With heavy hearts our Max Force team made our final trip of the 2008 racing season to Mobile International Speedway for the annual awards banquet. The Moose bolstered by family, team members, sponsors and friends was awarded the US Army Rookie of the Year title for the Fausak Tire Pro-Late Model Division. The Moose completed every point’s race at MIS this season and earned his 3rd Rookie of the Year honors in his 3rd different division in his first 3 years of stock car competition. 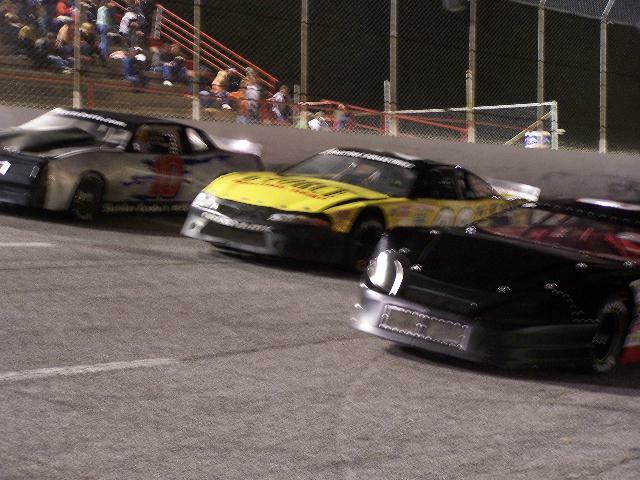 (MIS Super Stock 2006, Pensacola Super Stock 2007, MIS Pro-Late Model 2008) The countdown to the 41st Annual Snowball Derby Continues this Saturday with an all day test at Pensacola’s Five Flags Speedway. 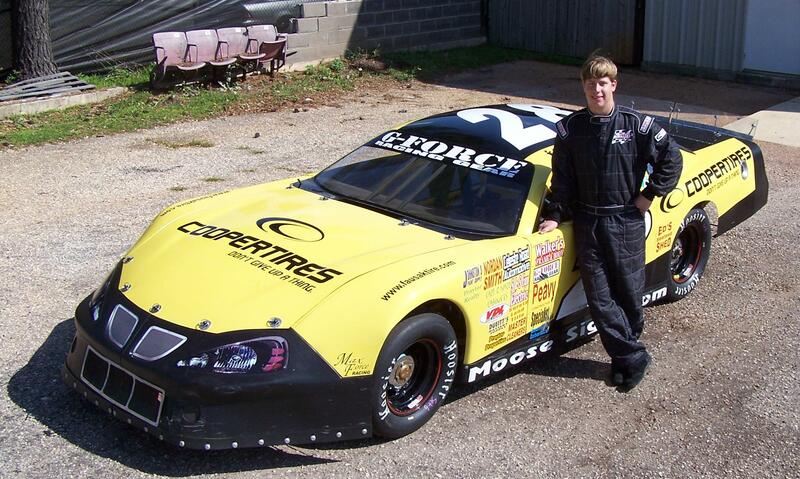 Thomas Praytor 11-9-08: With the 41st Annual Snowball Derby less than a month away, the Moose made his first late model laps at Pensacola’s Five Flags Speedway. After being roughed up in the Lee Fields Memorial 100 at Mobile International, the team spent the last 3 weeks rebuilding the Golden Flake Pontiac inside and out. Off the trailer it didn’t take long for the Moose to get comfortable in his old Super Stock stomping grounds. 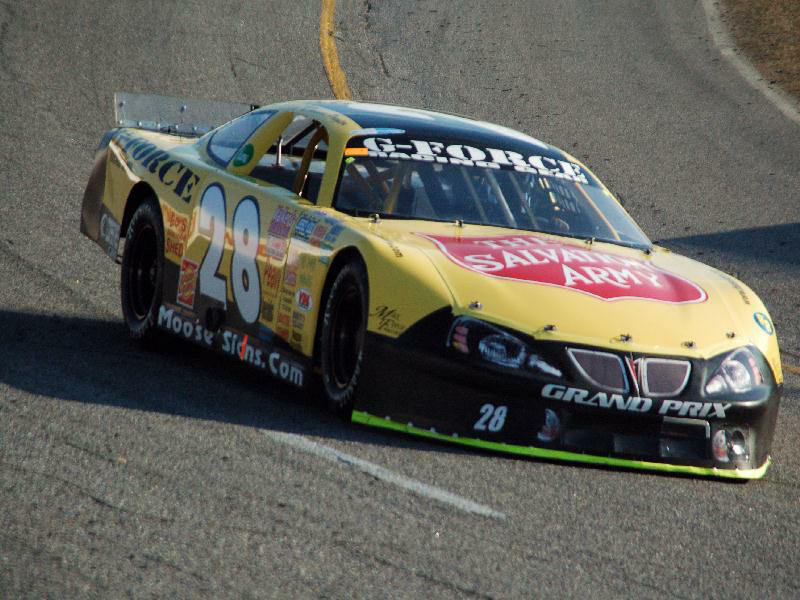 The team made big gains on the handling of the Max Force Pontiac as the MIS US Army Rookie of the Year winner made laps at 5 Flags. The Moose’s test session ended early with a cut right rear tire going into turn 3, the car whipped around and smacked the outside retaining wall. The team has already stripped the car, rehung the body and has the body on its way to the paint booth. With the next test scheduled for the 22nd the team will be hustling to be ready to turn the Moose loose! With the drop of the green flag of the Lee Fields Memorial 100 the Moose was on the move. 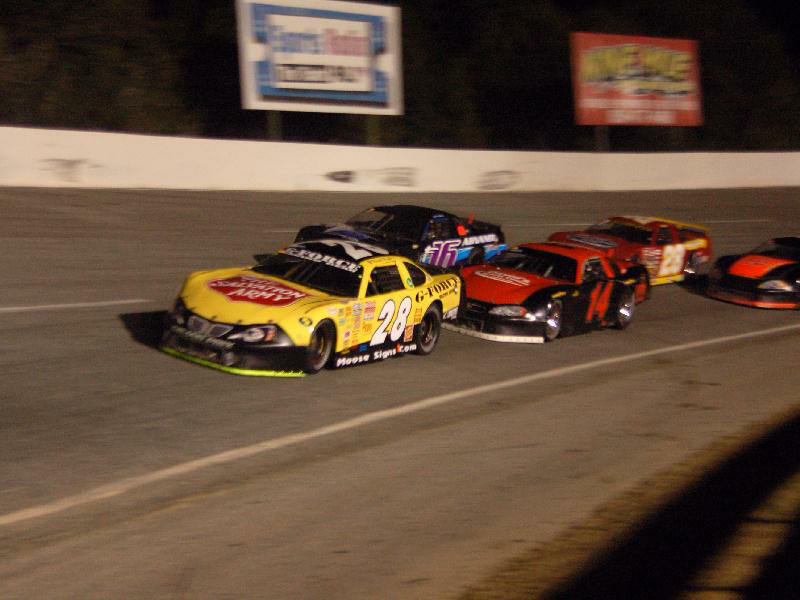 In the opening laps, the Golden Flake machine had powered from 9th to 7th putting 3 car lengths on the 8th place car. On lap 4 the 2 cars in front of the Moose got together and started spinning, the Moose checked up and looked like he had the wrecked cleared when he was body slammed from behind. The hit shoved the Moose into the 2 wrecking cars and the 4 cars collectively went over the racetrack and off of turn 3. The Moose made his way back on to the track but a shot at a good finish was gone. The nose was crushed and the left rear had taken a significant impact with the nosepiece of the car that had piled into the Moose stuck inside of the Moose’s car. Several quick cautions played into the teams hands as repairs were made to the Golden Flake machine keeping it on the lead lap. Back on track, the car was a mess with tape holding on enough body parts to keep from getting blacked flagged. Under speed the car was worse than it looked, the left rear spring had been shoved into the rear end housing making the car bounce as it when into the turns. To add to the mess the motor was over heating because the air box had been crushed. Another caution with an extended red flag gave the team the time it needed to remove the hood and enough of the air box to allow precious cool air to the motor. Air was critical; overheating would have ended the night. All of this and the 100-lap race had completed less than 20 laps. Fingers crossed the team sent the Moose back on track with very little hope of finishing the Moose’s first Lee Fields Memorial. Back under green the Moose had his hands full. There was no travel in the rear end and the car bunny hopped into every corner, pushed hard in the center of the corner and was snapping loose off the corners. The race took on a green flag look and for the next 60 laps the Moose was working over time with an ill handling racecar. The Golden Flake machine finally got away from the Moose on lap 90 sending him to the top of the track bringing out a caution. In desperate need of a bag of Golden Flake NRG Overload energy chips the Moose only had 10 laps left. With 5 to go a car that was a lap down to the Moose turned him around bringing out the final caution of the night. Somehow the Golden Flake machine survived again and the Moose made the final 5 laps to the finish. All the tape, all the work paid off with the Moose earning an improbable 10th place finish. Next up on the schedule, testing for the 41st Annual Snowball Derby at Pensacola’s Five Flags Speedway. Thomas Praytor Mobile, AL 10-9-08: The Moose put the finishing touches on his Golden Flake Pontiac Thursday night at Mobile International Speedway. The US Army Rookie of the Year contender in the Fausak tire Pro-Late Model Division has been trying new setups all year and Thursday night’s 4 hour practice session was more of the same. As with most test, some thing worked and some didn’t but overall the Golden Flake machine was crisp if not just down right crunchy. Saturday night is the season finale at MIS with the Lee Fields Memorial 100 taking center stage at the high bank oval. To help celebrate Lee Fields legacy, our sponsor, Golden Flake, will give away over 500 bags of its newenergy chip, NRG Overload, at intermission. The Lee Fields Memorial 100 is slated for Saturday night at Mobile International speedway at 8:00 PM. Coming in to the final weekend of racing at MIS the Moose is leading the US Army Rookie of the Year standings and sits 7th in the Fausak Tire Championship points standings just outside of the top 5. A good night could move the Moose into the top 5 in the Championship point’s standings. 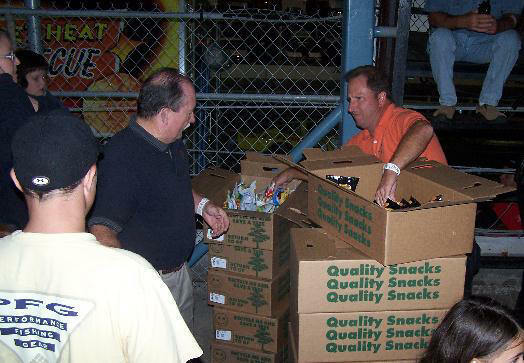 Golden Flake Snack Foods is a wholly owned subsidiary of Golden Enterprises, Inc. The Birmingham, Alabama based company was founded in 1923 and is publicly traded on the NASDAQ exchange, symbol GLDC. Golden Flake is a leading snack food supplier in the Southeast and is the official chip of Talladega Superspeedway, Auburn University, University of Alabama, SEC, Sunbelt Conference and the Rick and Bubba Show. For more on Golden Flake www.goldenflake.com. Thomas Praytor, Talladega, AL 10-5-08: With a little over a week until the final race of the 2008 season at Mobile International Speedway, the Moose was tuning up at Talladega. For the first time in 8 years the Moose sat behind the wheel of a dirt cart at the Talladega Short Track. The Moose helped dial in Gator Nations, Gene “Gator” Morris’s cart for the feature. Friday and Saturday the Moose lent a helping hand in the truck garage while taking in a dose of the Talladega infield on Friday night. The Moose missed Sunday’s race to return to the Max Force Racing shop to prepare for the Lee Fields Memorial 100 on Saturday night. Thomas Praytor 8-29-08: After taking a couple of weeks off while the Miller Lite Super Late Models spent a soggy afternoon at Mobile International Speedway, the US Army Rookie of the Year candidate is ready to get back in action. Along with his duties around the shop the Moose is completing his second week of classes as a University of South Alabama freshman. “We made some more changes to our G-Force Pontiac and tested earlier in the week. The car keeps getting better and I’m ready to race. Actually I’m ready to do anything other than school.” The Moose is currently 6th in the point’s standings, 13 points out of 4th and leads the Rookie of the Year standings in the Fausak Tire Pro-Late Model division. Including Saturday nights Labor Spectacular with fireworks and NASCAR’s Rick Crawford there are just 4 races left on the MIS calendar. Thomas Praytor Mobile 8-9-08: After a month of rain Mobile International speedway was back in action for the 2nd night of 4 nights of racing in August. Rain shortened Thursday night testing but the team picked up some valuable information in the few laps it was able to make. Off the trailer the Cooper Tires Pontiac was faster Saturday night than ever before and was within a couple of tenths of last weeks fast qualifier. With the pieces of the puzzle appearing to come together the team bolted on a new set of sticker tires for qualifying. New tire normally pick up your speed by a couple of tenths but this set slowed the Moose down over 4 tenths. The tire book showed the tires were the same size but were set at a different tire pressure. The team bolted on the practice set for the heat race and the Moose finished third. The team adjusted the tire pressures on the qualifying set for the feature and the Cooper Tire machine was better but not as fast as when it unloaded and the Moose settled for 11th in the feature. The team has the next week off whiled the Speedway host the Miller Lite 100 Lap Super Late Model Series. Thomas Praytor Mobile 8-2-08: After weeks of rain and testing the Moose was ready to get down to business on Saturday night. With a solid Cooper Tires Pontiac off the trailer the US Army Rookie of the year candidate qualified almost 4 tenths of a second faster than his last outing at MIS. The qualifying effort put Thomas 8th and looking forward to racing for the first time in a month. With the drop of the green flag the Moose was on the move and quickly moved up into the top 5 and looking for more. A tight racecar had the Moose chasing the backend of the car off the corners. After moving into 5th the right side tires slipped off the racing surface on the back stretch opening the door for the next 4 cars in line. After the slide off the back the Cooper Tire machine wasn’t the same and the Moose settled for 9th. Another solid performance has the Moose 4th in the Fausak Tire Pro-Late Model Championship standings with only 18 points separating 4th-9th. Picture: Thomas’s sign company Moosesigns.com sponsored the first annual Bomber Bash on Saturday night. Picture is Thomas and Bomber Bash winner Brandon Tipton in victory lane. Thomas Praytor Mobile 7-31-08: After weeks of being rained out the Moose and his Max Force Race team have gotten very good at loading and unloading their Cooper Tire Pontiac. Between testing and trips to the track for races that have been rained the team has loaded and unloaded over a dozen times in the last month without turning a competitive lap. While the racing action has been quiet the team has turned hundreds of laps testing. Last night the team loaded the Cooper Tire machine for Thursday night test and tune with rain falling at the shop and the racetrack. It looked like it was going to be another load and unload operation but with an all out effort by the MIS safety crew the track was dried and testing was on. The Moose and his revamped Cooper Tire Pontiac put in another solid test and the team is ready for Saturday night. Picture: After a solid month of rain the Moose spends more time looking skyward than at the racetrack. Thomas Praytor Mobile 7-26-08: After another disappointing practice on Thursday night at Mobile International Speedway, the team held a rare Friday test at the Speedway. Testing on Friday before a Saturday race is a huge gamble, any kind of problem and you don’t race on Saturday. 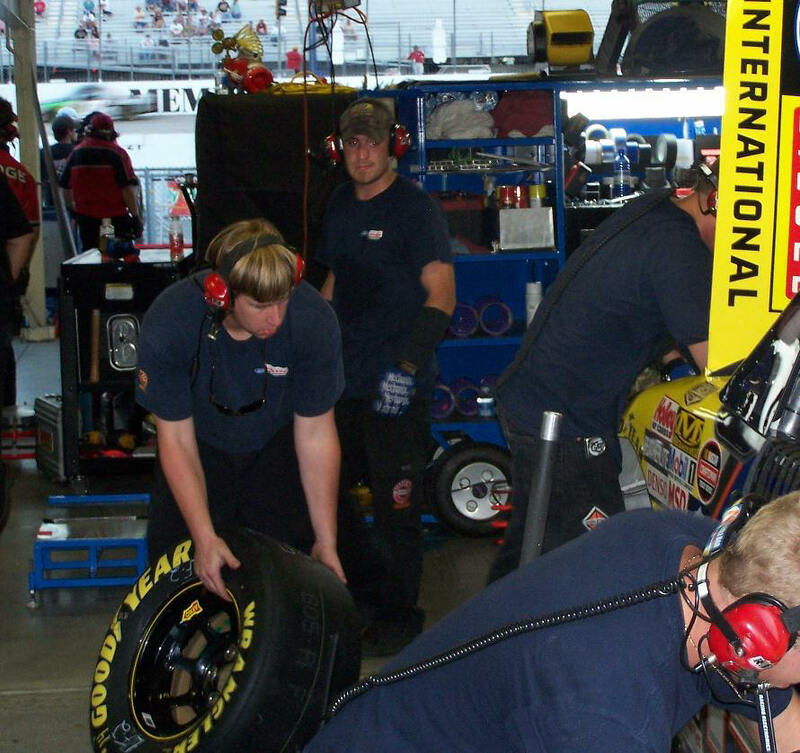 A late night at the track on Thursday, pointed the team in the right direction to make the Cooper Tire machine better. It took the team all day to make the changes and hurry back to the track for a test. Off the trailer, the Cooper Tires Pontiac was finally showing signs of life. The Moose felt a pulse for the first time in weeks and hit the gas. After struggling for most of the month of July the Cooper Tire machine was finally faster than when the month started. With an improved car the Moose was ready to race but Mother Nature had other plans, a record 4th rainout in a row. The Speedway has rescheduled for this Saturday night and will now be racing for 4 weeks in August. Thomas Praytor Mobile Testing: With so many new components on the Cooper Tire Pontiac the team has spent the last few weeks dodging rain showers and testing, testing testing. The latest test was like Halloween except it was more trick than treat. With each test and each lap we have successfully taken a top 10 car and turned into a last place Fausak Tire Pro-Late Model. At this point we might have a decent Super Stock. We do know that what should work doesn’t and so we are going to go with what shouldn’t. At least this way we want feel so bad when it doesn’t, because after all it’s not supposed to. Testing resumes Thursday night. Thomas Praytor Mobile, AL 7-12-08: After weeks of racing the stop watch, the Moose will have to wait 2 more weeks to line up his Cooper Tires Pontiac against other competitors in the Fausak Tires Pro-Late Model division. Rain circled the track most of the afternoon allowing a short practice before the bottom fell out ending the evening. Another round of testing is slated before the next scheduled start on July 26th. With an open date the Moose will be headed to Kentucky Speedway for the ARCA/ReMax Series and NASCAR Craftsman Truck Series races. Picture: Moose wishing for the rain to go away. 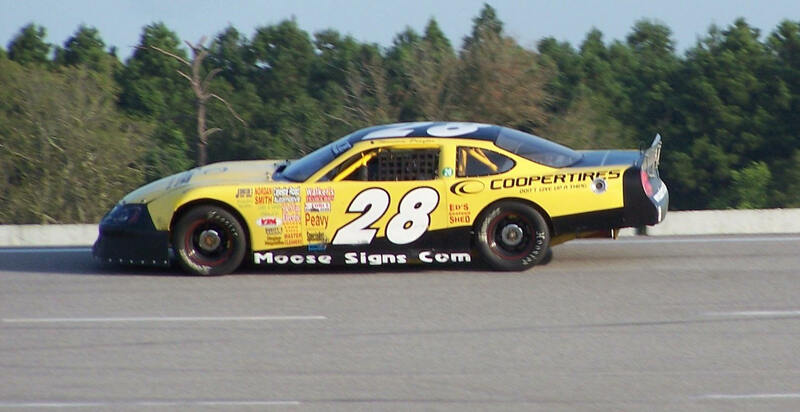 Thomas Praytor Mobile, AL 7-11-08: After a month of chop, cut and rebuilding on the Cooper Tires Pontiac the Moose spent the last week testing at Mobile International Speedway. With each test the Cooper Tires machine shows improvement and the hard work during the off weeks is paying dividends. We’ll turn the Moose loose on Saturday night at Mobile International Speedway when the Fausak Tire Pro-Late Models get back in action. Thomas Praytor 7-5-08 Dyno: With a new drive train and power plant installed the Cooper Tires Pontiac made a trip to Professional Engine’s chassis dyno. A chassis dyno is used to calibrate the horsepower the motor and drive train produce at the rear wheels. The dyno is a great place to check out new parts, which we have plenty of, before going to the racetrack. It’s more commonly used to tweak on the motor and drive train to see which combinations produce the most horsepower. The folks at Professional did a great job with both and the Cooper Tires machine is ready for a day of testing at the track with racing scheduled to resume July 12th. Picture: Cooper Tire Pontiac on the Professional Engine Chassis Dyno at 6,000 RPM simulating a 125 MPH run. 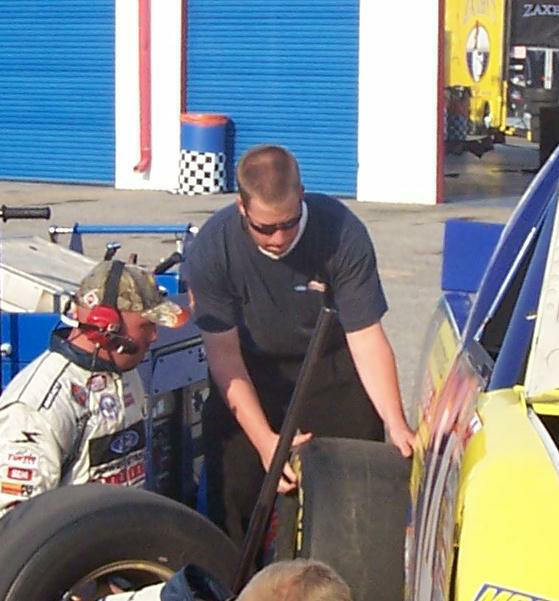 Thomas Praytor Memphis, TN 6-30-08: With a weekend off on the Gulf Coast, the Moose put in some time as a crew member at the truck race at Memphis Motorsports Park. Lending a helping hand with the trucks was the perfect medicine for a driver with no place to race. The Cooper Tire Pontiac is ready for its date with the chassis dyno and then will be made ready for testing at Mobile International Speedway over the weekend. Thomas Praytor 6-26-08: The Fausak Tire Pro-Late Model Division is at the mid season break, while the Miller Lite Super Late Models take the Speedway this weekend. 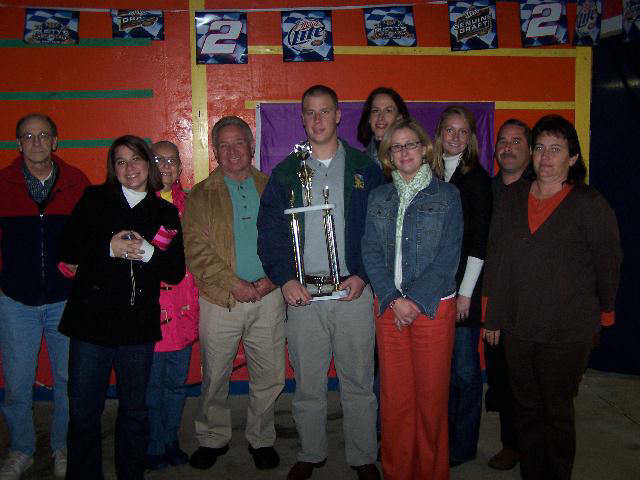 The Moose is currently leading the US Army Rookie of the Year Candidate, 6th in the Championship point’s standings and has not finished outside the top 10 during the 2008 points season. A solid start to the season would have most teams enjoying the time off but the Max Force team has been hard at work. Front to back the Cooper Tire machine is undergoing a complete makeover. The motor has just returned to the shop having been updated and freshened by Professional Engine and Machine. Along with a motor upgrade the team is upgrading the complete drive train, clutch, bell housing, starter, Jerico transmission and new rear end. While the motor has been out of the car the front end control mounts have been cut off with new style mounts installed and new control arms. The car may be better or worse but it won’t be the same. A trip to the chassis dyno and on track testing are next on the calendar. Thomas Praytor Mobile, AL 6-14-08: The action on the track was heating up for the last week of Mobile International Speedways Summer Sizzle. With rain in the forecast and rain all around the Speedway on Saturday night it looked like the cars would never make it out of the trailer. 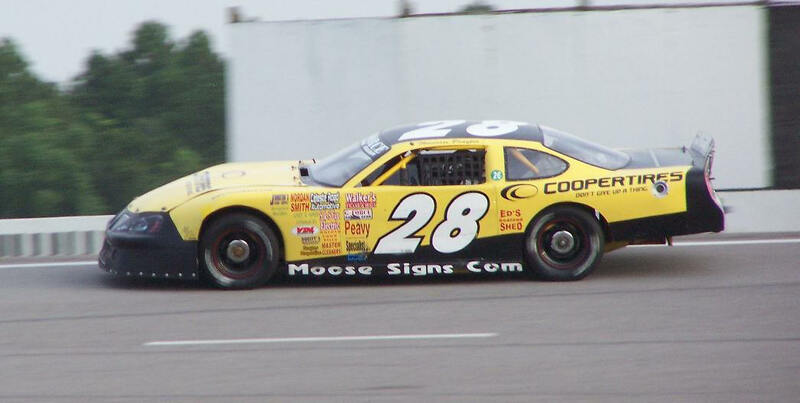 The rain did hold off long enough for the Moose to practice his Cooper Tires Pontiac but not long enough to qualify. The rains hit in the middle of Thomas’s qualifying effort and the Cooper Tire machine nearly took the hospital hop off of turn 2 but the Moose was able to keep it underneath him. Several efforts were made to dry the track with each drying attempt met by a fresh batch of rain. The Speedway is closed this week for repairs from the filming of Final Destination 4 and will be back in action on June 28th with the Super Late Models and the Fausak Tire Pro-Late Models returning to action on July 12th. 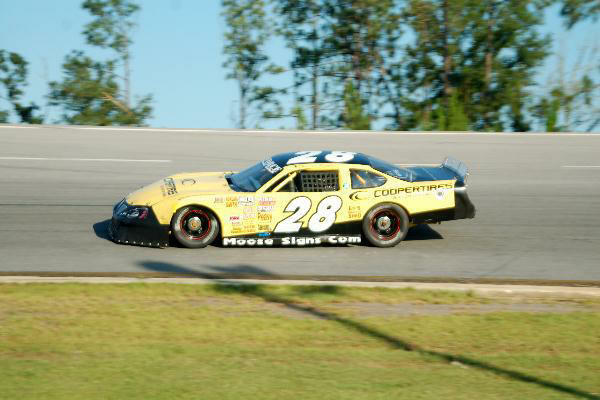 Thomas Praytor Mobile, AL 6-7-08: After dodging bullets in his 3rd late model start the Moose was looking for a faster Cooper Tires Pontiac and cleaner air, on Saturday night he got both. A week’s worth of work in the shop and a solid test on Thursday night raised the expectation levels for the US Army Rookie of the Year candidate and his Max Force Race team. Mobile International Speedway was hot, greasy and slow for the 2 practice sessions allotted for the Fausak Tire Pro-Late Model Division. The track was hot but cooler than the daytime start for the filming of Final Destination 4 a week ago. The common theme for almost everyone was tight, tight, tight. The team was taking baby steps and not getting any results. For qualifying the team took out the big stick and took a big swing. The gamble paid dividends and the Moose qualified 2 tenths of a second faster and 2 spots better than last week. Another set of changes for the heat race and the Moose put his Cooper Tire machine in the top 5. The team put more of a good thing to the car and the Moose turned in his best performance of the 2008 season. The feature race had an early caution, then went green the rest of the way. The Moose moved up from 11th to 8th and spent the last 15 laps on the bumper of Elliott Massey from Mississippi and came home 8th. The top 10 finish puts the Moose in 6th place in the Championship point’s standings. Picture: Thomas climbing in to his Cooper Tires Pontiac at Mobile International Speedway. Thomas Praytor Mobile, AL 6-6-08: After spending the week cutting the grass inside his Cooper Tires Pontiac, the Moose put his car through it’s paces last night at an open test at Mobile International Speedway. Testing has always paid dividends for the Moose and as a Rookie in the Fausak Tire Pro-Late Model division it pays off big. Last night the Moose and his team tried multiple setup combinations looking for more speed in their Cooper Tire machine. As with most test, some produced results and some didn’t. All valuable laps in helping the US Army Rookie of the year candidate prep for his 4th late model start. Saturday night is the meat of the Summer Sizzle sandwich for the Pro-Late Models at MIS, with the final race scheduled for next weekend. After being roughed up in round 1 of the Sizzle, the Moose is looking for a little pay back this weekend. Hang on, the Moose is loose! 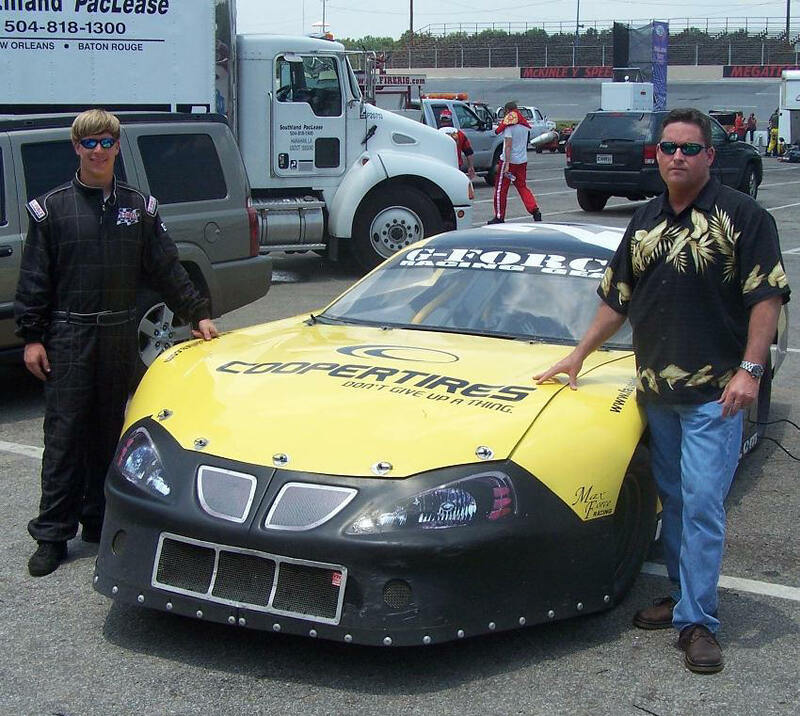 Picture: Thomas and Bobby Wickham of Cooper Tires with the Cooper Tires Pontiac on the set of Final Destination 4. Thomas Praytor Mobile, AL 5-31-08: Max Force Racing held its Annual Ronald McDonald House Fundraiser at Mobile International Speedway this past weekend. The event has become a fan favorite and with help from Mobile International Speedway and AIG American General the checks keep getting bigger. At intermission the Moose and his Cooper Tires team made their way into the grand stands to toss out Thomas McMoose t-shirts and sign autographs to help promote fan giving to RMH. We hope this year’s check will but our total contribution to Ronald McDonald House over $10,000. After spending a couple of week as a stunt driver for the filming of Final Destination 4 at Mobile International Speedway the Moose was ready to get back to some real racing in the Fausak Tire Pro-Late Model division. An over aggressive setup for qualifying relegated the Moose to starting closer to the back of the field than the front in his 3rd Late Model start. With the drop of the green flag the Moose used the stuntman skills learned over the last 2 weeks dodging wrecks and being wrecked. Before the day was over the Cooper Tires Pontiac was knocked out of the racetrack 4 times. Each time the Moose battled back on the track. Perseverance paid off and a bruised and battered the Moose’s Cooper Tires machine limped home 10th. Picture: Thomas signing autographs in the grandstands for Ronald McDonald House night. Thomas Praytor, Mobile, AL 5-22-08: Findley, Ohio based Cooper Tire & Rubber Company announced today that it will become the primary sponsor for the Moose during filming of Final Destination 4 and Mobile International Speedway’s Summer Sizzle. 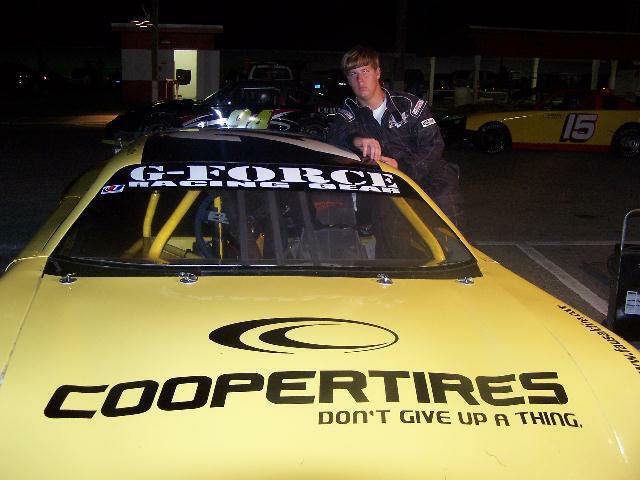 Since 1926 Cooper Tires vision has been, One Company…one team…one goal, that vision is mirrored at Max Force Racing. Final Destination started filming this week at Mobile International Speedway and will continue until Ronald McDonald House Night (Day) on May 31st. The Moose will be making tracks in his Cooper Tire Pontiac for the movie and the Speedway’s Summer Sizzle that starts this week and runs for 4 straight weeks of racing. Currently 5th in the Championship standings at MIS the Moose will only be making his 3rd start in the Fausak Tire Pro Late Model division when the green flag drops on our annual Ronald McDonald House fundraiser. Thomas Praytor, Mobile, AL 5-20-08: Filming for Final Destination 4 is slated to start tomorrow at Mobile International Speedway and will wrap during our annual Ronald McDonald House Fundraiser on May 31st. Over the last few months our Max Force Race Team has been preparing cars for the movie, some will come back and some will not. 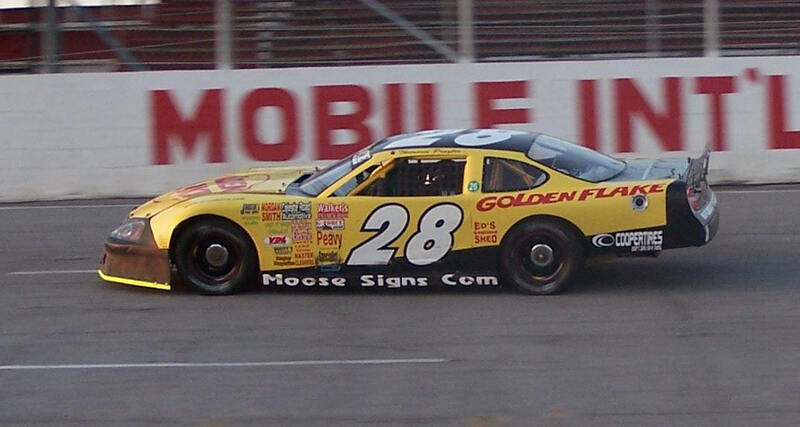 You might recognize this car as the Moose’s runner up car from Mobile and Pensacola in 2007. The car received a new body and a new wrap job for the movie and will be driven by a stuntman for the movie. This car will come back but the car we showed you last week will not. Remember the Ronald McDonald House race will start early, 3:00 PM, to accommodate the filming of crowd sequences for the movie. Thomas Praytor 5-13-08 Mobile, AL: The Moose will be one of the drivers for the racing sequences of Final Destination 4. The 4th installment of the Final Destination franchise will be filming at Mobile International Speedway starting on May 21st. The Speedway was chosen by New Line Cinema for the opening sequence of the 4th chapter of the popular Final Destination movies. With over 300 million in box office receipts, the Final Destination trilogy has been a hit with the under 30 crowd since it’s first premonition. For those not familiar with the movies, each movie starts with a premonition of a disaster and people being saved by the premonition. But you can’t cheat death and death spends the rest of the movie tracking down those who were saved or thought they were. In Final Destination 4 the premonition starts the movie at a racetrack. An open casting call for extras is being held at the Civic Center this Saturday from 11-2. Filming will culminate on May 31st during our annual Ronald McDonald House Fund Raiser. The race time has been moved from 8:00 PM to 3:00 PM to accommodate the film crew. The Speedway has created a special limited edition ticket for the 31st and they are on pre-sale now at McConnell Automotive, Fausak Tires, Bob’s Speed Shop and Praytor’s Collectibles. In addition to the Moose driving in the movie Max Force Racing has been preparing cars for the movie. A car owned jointly with Rick Crawford was delivered a few weeks ago and the car pictured above will be picked up this week. We will deliver another car next week. Thomas Praytor Mobile 4-19-08: For his first regular season start the Moose carried a special SPS 5A State Champion hood signed by his teammates. While the team had won the title with a big Senior class, the Moose was looking to make his first regular season start as a Late Model Freshman. Rain the night before had the Moose looking for the handle on his G-Force Pontiac. The Moose struggled with the green racetrack but never got a handle on the Speedway. By playing dodge ball and missing the wrecks the Moose was able to salvage a top 10 finish coming home 9th. Saturday night’s finish couple with his top 10 in the 95 KSJ 95 puts the Moose 5th in the Championship points standings. Thomas Praytor Mobile 4-14-08: The Miller Lite Super Late Model Series was in action this past weekend giving the Fausak Tire Pro-Late Models the weekend off. The Moose used the down time to test, work on his G-Force Pontiac, test, work on his G-Force Pontiac and test, then work on his G-Force Pontiac some more. The early exit from the ASA Bayou Classic forced a complete rebuild of the front end of 10-K. The Moose’s first post wreck test was not good, the second a little better and finally after Sunday’s test it appears we may be ready to turn the Moose Loose on Saturday night. If the first 2 late model starts weren’t big enough, the 95 KSJ 95 and the ASA Bayou Classic, Mobile International Speedway is hosting St Paul’s Football 5-A State Championship night on Saturday night. The St. Paul’s football team, along with the Moose will be recognized at half time. So, for his third career late model start and first regular season start, the Moose will run a special SPS hood signed by his teammates. No pressure. Thomas Praytor Mobile4-18-08: The Moose completed testing last night for the Saint Paul’s 5-A State Championship night at Mobile International Speedway on Saturday night. 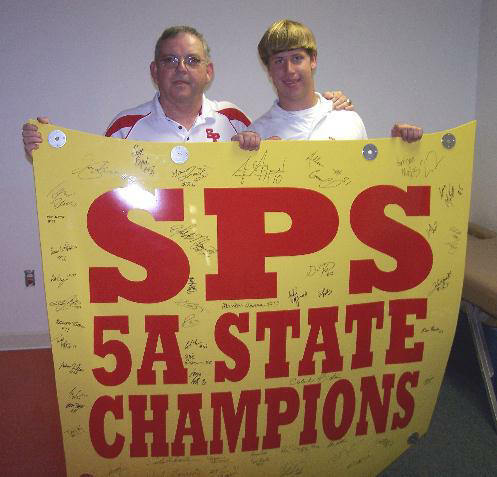 The Moose will run a special SPS 5-A State Champions Hood that has been signed by his teammates. The team will be recognized at intermission by the Speedway and Coach Smith will drop the green flag on the Pro-Late Model Race. Pictured above is St Paul’s Head Football Coach Mike Bates with the Moose. Thomas Praytor Mobile 3-22-08: After making his first late model start in the 95 KSJ 95 at Mobile International Speedway the Moose filed an entry for the inaugural ASA Southeast Asphalt Tour Bayou Classic 100. Pulling into the speedway for practice on Friday the Moose realized the price of this poker tournament was a lot higher. Thirty-four cars were in town for practice on Friday night and the series added another half dozen on Saturday. The Moose in his second career late model start was up against some of the best names in short track racing in the country. For the Moose, learning from the best was big. How good was the field? In the 95 KSJ 95 the Moose qualified with a 18.35 second lap and he started 18th. This week the Moose improved his G-Force Pontiac by 4 tenths of a second (that’s a lot in short track terms) with a 17.98 second lap. In the 95 KSJ 95 he would have started 6th in the ASA Bayou Classic he started 31st. Happy to be in the field the Moose was looking to log 100 laps and gain valuable track time for the upcoming 2008 MIS regular season. From the drop of the green flag the Bayou Classic turned to Bayou brawl. The Moose dodged 3 of the first 4 cautions and that was by lap 5. Another car bounced off the Moose for caution 4 at lap 7. Coming to the green on lap 7, Kyle Fowler jumped to the outside trying to gain positions before the start finish line. Fowler made up several spots until he ran out of real estate coming off turn 4. Instead of spinning out Fowler hit the gas cutting across the hood of the Moose sideways, ripping apart the left front, then hit the car inside of Thomas ending his day and the Moose’s. We would normally give Fowler the idiot of the race award but unfortunately he was not the only one to have a brain embolism on Saturday night. By lap 25 what had been a full field of 36 cars was down to less than 20. The team is already hard at work getting the G-Force Pontiac ready for the MIS Season opener on April 5th. Thomas Praytor Mobile 3-20-08: A top 10 finish in last weekends 95 KSJ 95 set the table for the Moose to file an entry for this weekends inaugural ASA Southeast Asphalt Tour, Bayou Classic 100 at Mobile International Speedway. Over the years the ASA Series has produced some of the biggest names in racing. Jimmie Johnson, Matt Kenseth and Reed Sorenson all made their way to NASCAR through the ASA Series. This weekend, the Moose will attempt to qualify his G-Force Pontiac in the Bayou Classic 100 in only his second Late Model start. For the first time at Mobile International Speedway the new ASA Southeast Tour will combine Super Late Models and Pro-Late Models. The Super Late Models are being detuned with smaller carburetors to try and put them on an equal playing field with the Pro-Late Models. Equal or not the merging of the 2 talents pools of drivers should make for a great race. Thomas: “This is a pretty big step for my second start but the opportunity to race with guys from around the country on my home track was just too good to pass up. You look at the guys who have raced in the ASA Series and it’s pretty impressive. Just making the field will be an accomplishment. Thomas Praytor Mobile 3-15-08: The Moose opened a new chapter in his racing book with his first Late Model start in the 95 KSJ 95 at Mobile International Speedway. Normally, your first race in a new class is a 25-lapper or a heat race of 6 laps to kind of get your feet wet. Not the Moose, he jumped in to the biggest Pro-Late Model race in MIS history. The Moose qualified 17th and would have a long way to go to see the leaders. Flagman Eddie May dropped the green flag on 95 laps of green flag action and 95 laps of fireworks followed. The Moose raced hard and missed some big wrecks, including a dodge that sent 10K to the grass on the backstretch. Lap after lap the Moose’s G-Force Pontiac kept getting better. The team made adjustments to his car and by the halfway point the Moose was picking up places. The 95 KSJ 95 became a 2-hour marathon with the Moose working his way up to 9th. Picture: The Moose making a pass during the 95 KSJ 95. 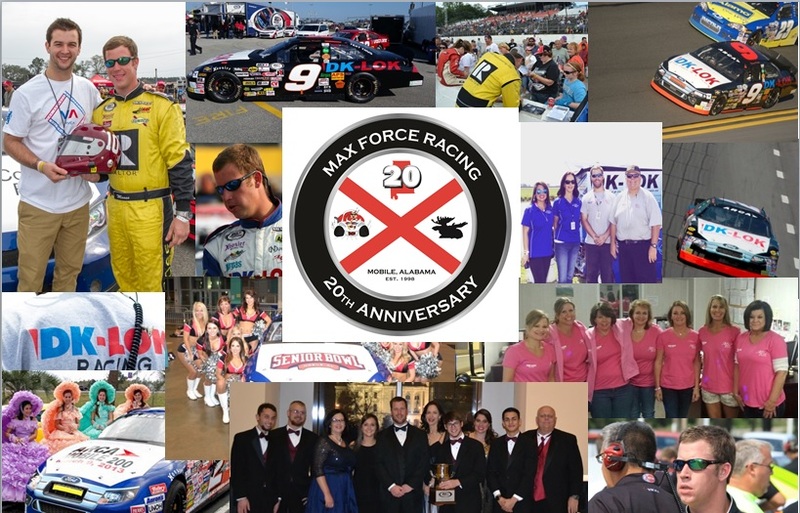 As the 2008 racing season is set to get underway our Max Force Racing team will run special stickers in memory of Charles “Little Man” Bazzel. Little Man was one of Mobile International Speedway most popular drivers and was killed earlier this year in a truck accident. 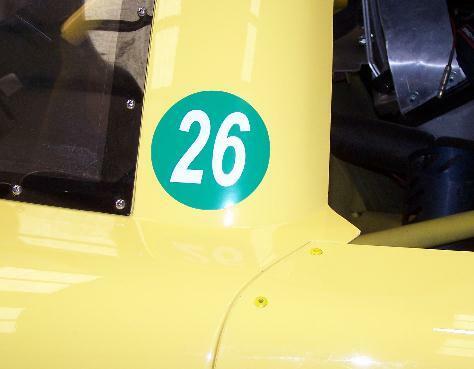 Both Tommy and Thomas have raced against Little Man and our G-Force Pontiacs will carry a 26 sticker in his memory. Earlier this week, Mobile International Speedway unexpectedly lost one of it’s own, "Little Man" Bazzel. Over the last decade Little Man raced his way into our hearts and became an MIS favorite in the pits and the grand stands. Little Man was known for a warm generous heart that he would truly give you the shirt off his back or the car off his trailer if you needed it. The Moose starts the 2008 season this weekend with a double-header. Tonight in Pensacola with the G-Force Racing Super Stock and Saturday night the Moose will make his first Late Model start in his G-Force Pontiac in the 95 KSJ 95 at Mobile International Speedway. Thomas Praytor Pensacola 3-15-08: The Moose rolled into 5 Flags Speedway for the season opener looking to give the Pensacola fans something to talk about. 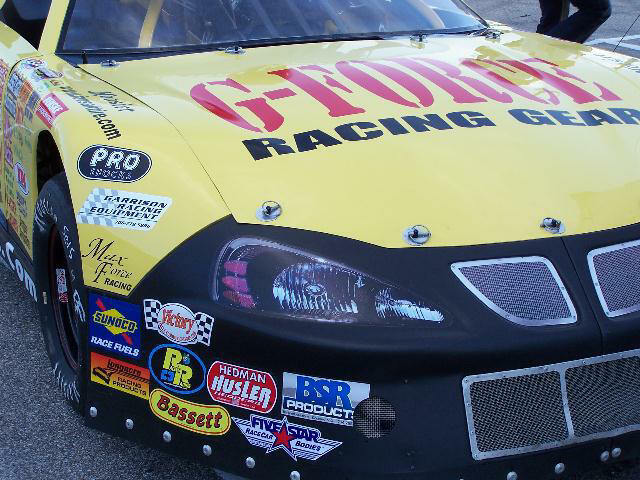 With the Moose playing in the football State Championship last season, the G-Force Pontiac has been on jack stands in the Max Force shop waiting on last years Snowball Derby. The rust hadn’t just formed on the car, the Moose had a little rust to knock off also after having spent the winter testing the new late model for tonight’s 95 KSJ 95 in Mobile. The crew chief freed the G-Force Pontiac up just a little too much for qualifying and the Moose would roll off 11th in a big opening night field of Super Stocks at 5 Flags. By the halfway point in the 25-lap feature the Moose had moved up from 11th to 4th but had paid a heavy price. Tires and brakes are critical at Pensacola and the Moose had abused both going to the front. After going forward the first half of the race the Moose spent the second half of the race hanging on and settling for 7th. The Moose continues round 2 of the doubleheader opening weekend as he makes his first late model start in the 95 KSJ 95 at Mobile International Speedway. Thomas Praytor Pensacola 3-13-08: At 17 the Moose spent the majority of the 2007 season as the points leader at Pensacola’s Five Flags Speedway and ended up just 13 points away from a title in his first season at Pensacola. The story line all year at 5 Flags was the Moose’s title run in his Rookie season. At least you would think it was. The following is 5 Flags pre-race story for this weekends Super Stock season opener. No mention of the Moose? We looked high, we looked low, we even looked in the woods off of turn 3 but no Moose at 5 Flags. Turning the Moose Loose is always entertaining. Turning a MAD Moose Loose, that’s scarier than the Tower of Terror at Disney World. The Moose starts the 2008 season this weekend with a double-header. Friday night in Pensacola with the G-Force Racing Super Stock and Saturday night the Moose will make his first Late Model start in his G-Force Pontiac in the 95 KSJ 95 at Mobile International Speedway. Thomas Praytor Mobile 3-4-08: The Moose put his G-Force Pontiac through it’s final preseason paces this weekend at Mobile International Speedway. After 2 years in the Super Stock division at MIS the Moose is prepping for the 95 KSJ 95 Pro-Late Model race on March 15th. The 95 KSJ 95 will kick off the most ambitious race schedule for Max Force Racing in its history and will have the Moose doing double duty at Pensacola’s Five Flags Speedway and Mobile International Speedway. Thomas Praytor 1-13-08- Last week, Mobile International Speedway announced it will start its 2008 season with the 95 KSJ 95 lap Pro Late Model race on March 15th. The Moose was one of the first drivers to confirm an entry for the first ever 95 KSJ 95. Not only will it be the first 95 KSJ 95 it will be the first career late model start for the Moose. 95 laps is more than double the length of a normal Saturday night race and could be an intimidating start for the late model rookie. “I’ve got a lot to learn with my new car but I like running the longer races. 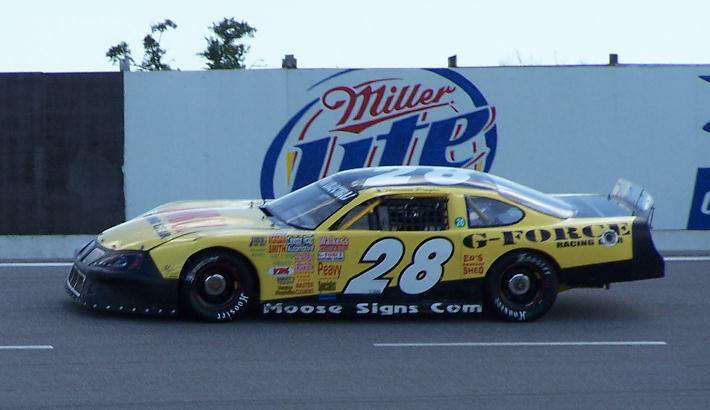 Starting with a race sponsored by KSJ is really cool and I’m looking forward to making all 95 laps in my G- Force Pontiac.” Said the Moose. With the 2007 racing season fading in the rear view mirror, our Max Force Racing team has been busy in the shop preparing for the 2008 season. Since the Derby 2 cars have been prepped and moved out of the shop and we are half way through a 3rd with the Pensacola car ready to race and the Mobile car taking shape working to a test date in late January early February. Stay tuned for a complete Moose schedule for 2008. MIS new web site, www.mobilespeedway.net, 95 KSJ- www.95ksj.com. Thomas Praytor 2-25-08: The Moose started the 2008-racing season with a couple of weekends of racing in Daytona Beach. From the short track at New Smyrna, to the dirt track at Volusia, to the high banks of Daytona International Speedway the Moose loaded up with a heavy dose of RPMs. With Daytona in the rear view mirror the Moose filed an entry for the 95 KSJ 95 on March the 15th at Mobile International Speedway. 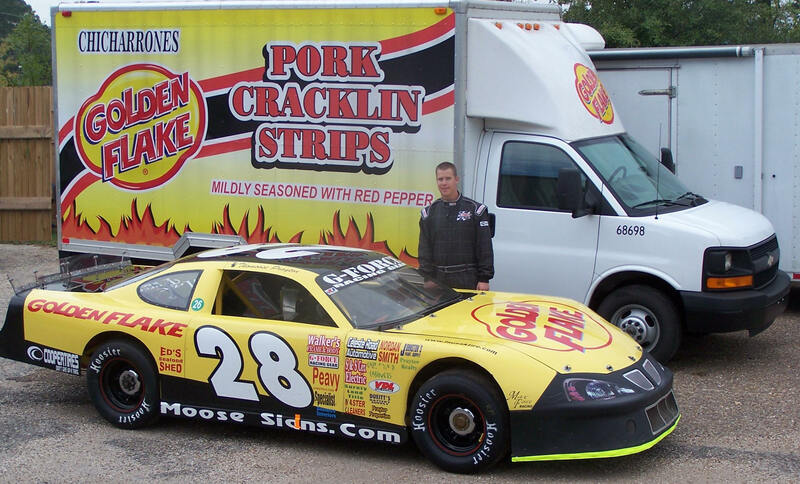 After back-to-back Rookie of the Year titles in Mobile and Pensacola in the Super Stock division, the Moose will make the move to the Pro-Late Model class at MIS in 2008. This past weekend the Moose turned over 100 laps in testing prepping for his first Late Model start in the 95 KSJ 95 on March the 15th. Thomas: “This is the 4th style car I’ve driven and each one has had a completely different feel to it. Our new G-Force Pro-Late Model is a lot of fun to drive. We’re not as fast as we would like to be but this is a brand new deal for us. We’ve worked really hard making this car better every time we go out and we’re faster than where we started but we have a ways to go to catch the guys up front.